Specialising in cars, small vans, large vans from Bridlington to London Manchester, Leeds and Glasgow. 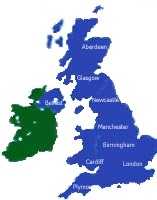 In fact Fastspeed Couriers offer same-day urgent delivery services from East Riding of Yorkshire to all parts of the UK so we can supply a Car / Small Van / Large Van to Birmingham , Glasgow , Leeds , Cardiff , Derby, Sheffield, Bristol , Nottingham , Leicester , Swansea or Plymouth etc. Fastspeed are the specialists in urgent Bridlington courier jobs. As a part of the largest network of sameday national couriers in the UK we offer access to tens of thousands of vehicles, based all over the UK at strategic points. This gives us the the resources and flexibility to handle all of your urgent delivery needs. Our UK couriers collect from most major towns and cities across East Riding of Yorkshire and the UK within 30 - 60 minutes.